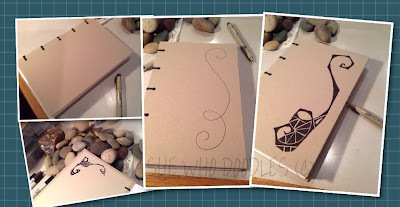 A while back I purchased two hand bound journals from Tracey at Our Little Cottage Shop. She makes beautiful hand bound journals. I asked her to make me a plain journal that I could doodle. She sent me two beautifully bound journals. The tan paper she used for the cover was perfect to doodle, it had a nice smooth finish and bound with black thread. The inside pages are a nice weight to either write on or draw. I've been looking at them for several weeks thinking about what I was going to design on them. I was worrying about booboos, but there is no booboos that can't be fixed so I quit worrying and just grabbed my pen and started. I'm using a #8 Micron as usual, here's a pic of the journal and my first stroke of the pen. I just build on what I start with, no real plan, totally freehand. It's finished and signed. I hope Tracey likes what I did to her journal. Now to start the second one. Here's a look at the final design. I've signed the back cover and added my logo. There is also a small design inside the front cover. I'm not posting to Etsy just yet, I have a Holiday Sale this weekend at Mt View High School here in Vancouver. So will try selling them there first. Check out Tracy's site, she also has an Etsy Store with many of her journals for sale. They are all beautiful and one of a kind. I may be doing more if these two sell right away. I've been experimenting with several items to doodle, I will post soon.